The little lame balloon man is whistling…winter finally broke today. 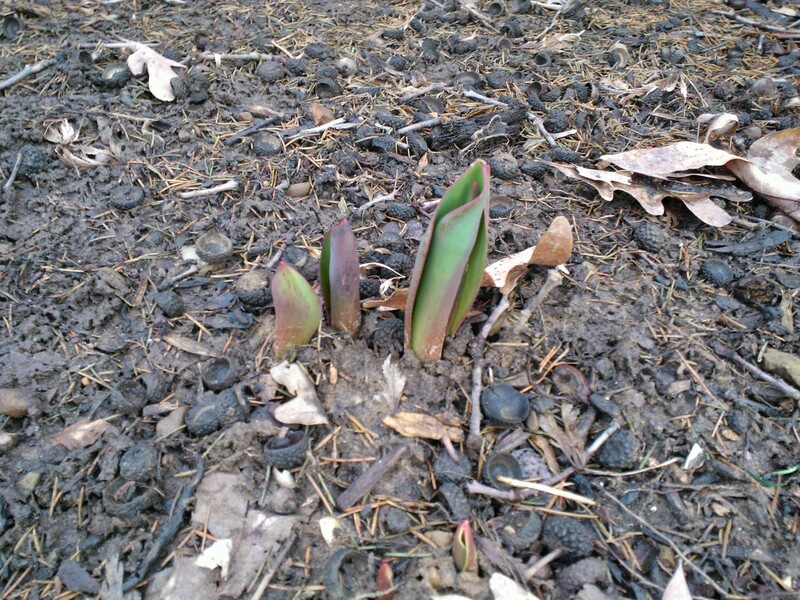 My tulips have managed to withstand the late snows and are still making progress in popping up. Star Trek Deck Building game (TNG) –The co-op mode is pretty fun, but the rules are super vague and unhelpful. At the end of the game we decided that: you cannot use Sensor Scan before exploring, and all players pool their stats to beat Locutus. Last Night on Earth: The Zombie Game–We zombies won pretty easily. Dominion–Another classic. And I won! Pandemic: On the Brink–My first time playing with the mutation, very fun! This expansion is awesome because it has petri dishes to put the cubes in, and you can label what the diseases are. But I change my mind about that all the time. Sometimes I think of yellow as AIDS, and sometimes as malaria. Red could be bird flu, or SARS. Eminent Domain –Love the scifi theme, but I’ll have to play this a lot more before I fell more confident about strategy. I had a pretty rough week at work, so I’m looking forward to the holiday weekend. I’m catching up on all the TV shows I’ve DVRed this week. My favorite so far: the 100th episode of Psych! It’s a cute take-off on the hilarious movie Clue. And there were also a couple of references to another great murder-comedy, Murder by Death: the screaming doorbell, and the moose on the wall. MbD is a classic: great cast, hilarious spoofs of famous fictional detectives, twist endings. And thanks to this movie (as well as the new Pride and Prejudice), my husband knows that he can’t sit next to me at a formal dinner. I read this just because of the e e cummings title, but found it entertaining overall. Happy Easter to you and Brendan!